With a world increasingly dependent on technology, electrical engineers are in high demand. At The Catholic University of America, you will study not only the power of engineering to drive technological advances, but also its potential to improve the lives of those around you. Electrical engineers are creative individuals who apply scientific principles to solve real-world problems. At The Catholic University of America, your study of scientific principles will be complemented by courses in the liberal arts, providing you with a well-rounded education. When you graduate from the program, you will have strong critical thinking skills and an enthusiasm for life-long learning, two keys to success in an exciting and constantly changing field. Catholic University's rigorous engineering program will prepare you well to enter the engineering field or go on to further study in engineering, law, or medicine. The School of Engineering offers eight different majors and concentrations. If you are interested in Engineering but aren't sure that Electrical Engineering is the right major for you, you can begin your studies as an Engineering Exploratory student. Exploratory students take math and science courses that serve as a foundation for the different specializations available in the Engineering field. These classes also fulfill requirements for various majors in the School of Engineering. In your first year at The Catholic University of America, you will take philosophy, theology, and English classes as part of a small learning community of about 18 students. These courses will help you to examine the interplay between your work as an electrical engineer and society at large. With a strong ethical foundation, you will be equipped to use your engineering skills to change the world for the better. The nation's capital is an exciting place to be a student. With museums, concerts, and other cultural events just a few Metrorail stops away, you will always have something new to explore. Additionally, there are many opportunities to gain valuable practical experience with internships or research opportunities at a number of local organizations, including NASA and the Naval Research Lab. The Department of Electrical Engineering and Computer Science is a small community with a faculty of leading researchers and vibrant students who are dedicated to learning. You will be in small classes, allowing you to interact closely with your professors, and work together with your peers to complete group projects and assignments. Increasing developments in technology have created a demand for electrical engineers in a number of different fields. The engineering knowledge and leadership skills that you will develop at The Catholic University of America will prepare you well for any discipline you choose to enter. Electrical engineers are major players in the design of technologically advanced systems that include commercial applications, space exploration, national defense, and medical technology. 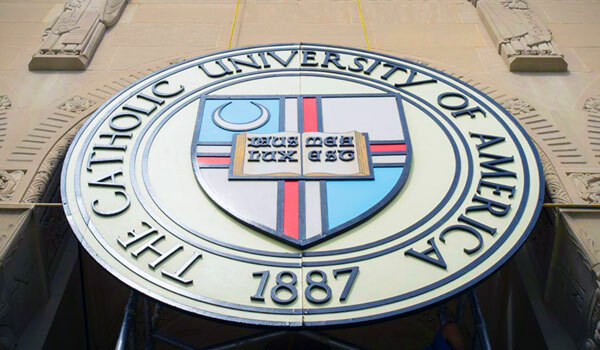 At The Catholic University of America, you will gain the skills and perspective necessary to succeed as a creative and thoughtful electrical engineer, armed with proficient technical knowledge and guided by a tradition of service.